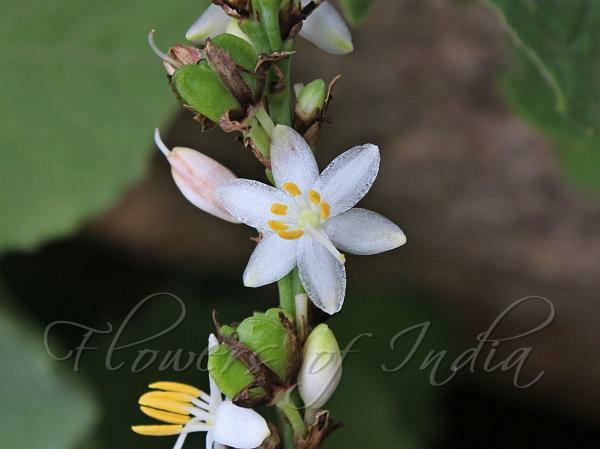 Indian Chlorophytum is a perennial herb with fleshy tuberous roots. Leaves arise from the root, up to 30 x 2 cm, flat, lanceshaped, tip pointed, margins thinly hyaline, frilly. Flowers are borne in racemes atop a stem. Flowers are white, bracts up to 3 cm long, ovate. Flower-stalks are up to 1 cm, jointed at the middle, tepals 1.5 x 0.5 cm, oblong, spoon-shaped, stamens 7 mm, basally fused, ovary subglobose, 5 mm, style to 1 cm, stigma 3-fid. 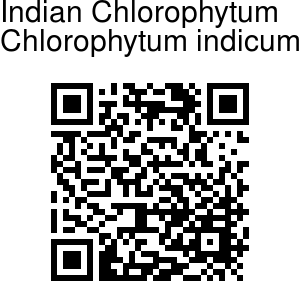 Indian Chlorophytum is found in the Western Ghats, predominantly in Kerala. Identification credit: Medha Rao Photographed at Makalidurga, Karnataka.